Cornelia Hahn Oberlander, who has been a landscape architect for more than sixty years, considers her profession &#x201c;the art of the possible.&#x201d; The description also applies to the very way this remarkable 86-year-old has lived her life. Playing in her grandmother&#x2019;s garden as a child, Cornelia absorbed the beauty and importance of the natural world and by the age of eleven had decided that she would become a landscape architect.<br /><br />Leaving her native Germany in the wake of Hitler&#x2019;s persecution of the Jews, the teenaged Cornelia was transplanted in America, where she could pursue her dream in safety, although not without having to struggle to carve out a place for herself in the male-dominated world of her chosen profession. 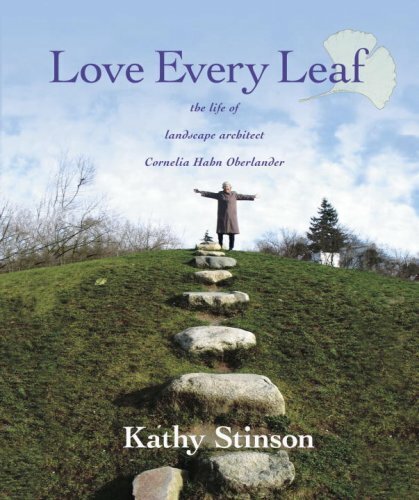 This 96-page biography tells her remarkable life&#x2019;s story, complete with photographs and plans for the imaginative playgrounds and the innovative museum and embassy grounds she has created around the world, and for green rooftops, her latest passion. Young readers will not only learn about the profession, but also will find inspiration in Cornelia Hahn Oberlander&#x2019;s love for the natural world and the respect and concern she shows for our increasingly fragile environment. Kathy Stinson was born in Toronto. She was a mail sorter, elementary school teacher, and a waitress before she turned her hand to writing. It was a wise decision. She wrote <b>Red Is Best</b> and <b>Big Or Little</b>. Since then, she has had over thirty titles published for a wide range of audiences. Kathy Stinson has two grown-up children, two grown-up stepchildren, and five grandchildren. She lives with her partner, Peter Carver, near Rockwood, Ontario.